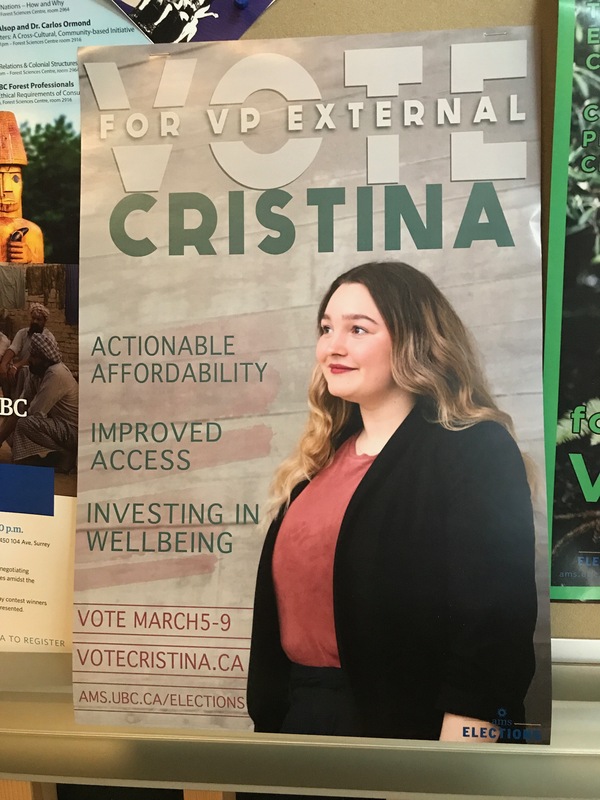 From the Cult: We review campaign posters because why not? Editor’s note: We’ve updated this article to include our hot-take on the poster of Rodney Little Mustache. 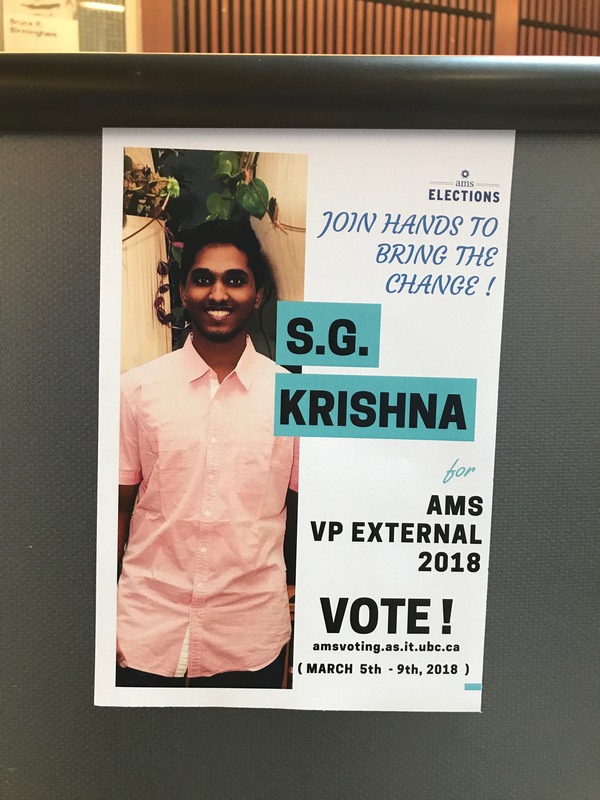 We’ve also included an updated score and comment on S.G. Krishna after he went from having not enough posters to arguably too many. From the Cult is The Ubyssey’s unofficial AMS Election coverage. If you want real news, go over to the news section. 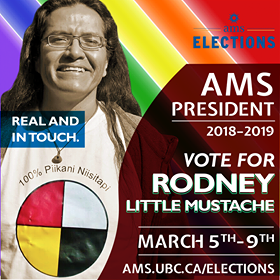 In case if you’ve been living under a rock, the 2018 AMS election draws nigh. 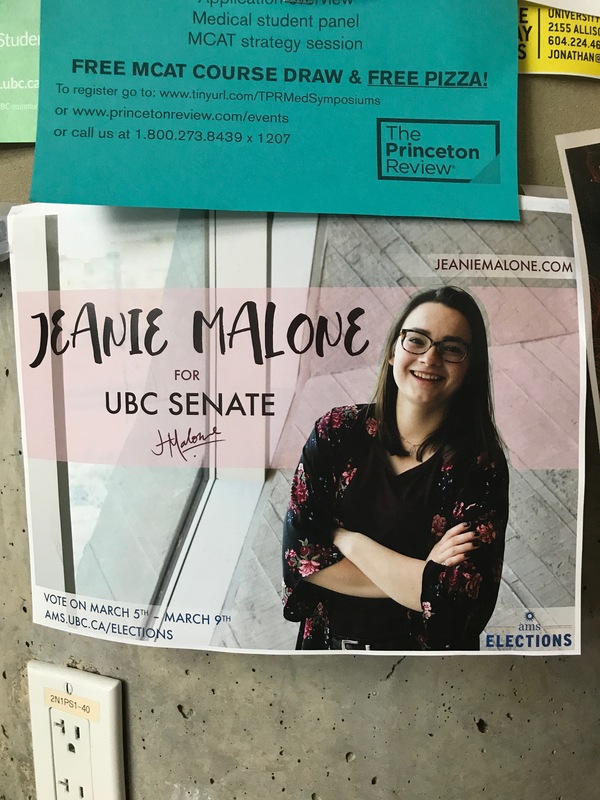 Whether you do happen to live under a rock and I’ve offended you dearly or simply don’t care for student politics, it’s tough to miss the campaign posters trickling into bulletin boards scattered throughout campus. 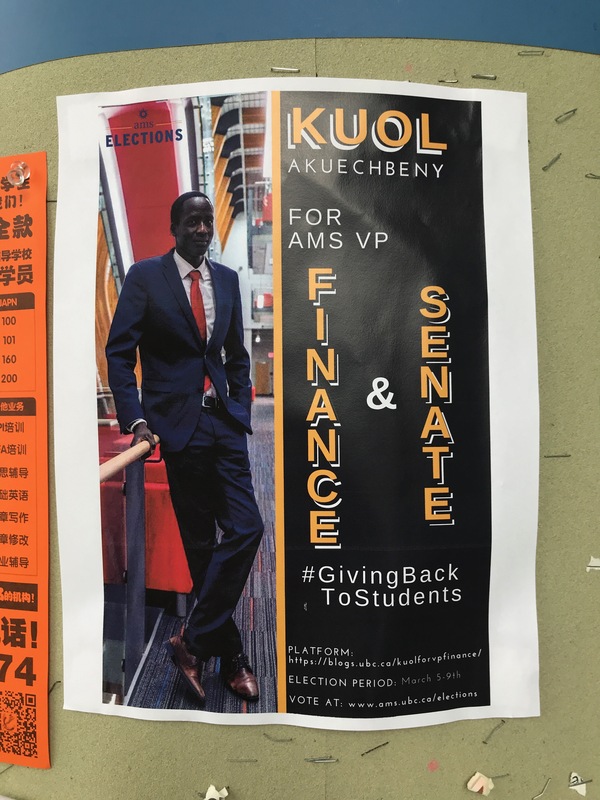 Personally, when I think of campaign posters, I think of relevant pop culture references set in distasteful Microsoft Word word art, but the posters coming from this year’s candidates’ vying for AMS royalty are anything but. They lack the spiciness and individuality of cheesy Microsoft Word graphics — in other words, they look like they utilized the exact same Photoshop template with a few tweaks in-between posters. This year’s election sadly lacks joke candidates like current AMS president Alan Ehrenholz, meat puppet of the almighty concrete slab dubbed “The Engineer’s Cairn,” so we’re left with serious posters that market their candidates as, well, serious. This isn’t to say that they’re all looking hot off the press from the Creative Review. 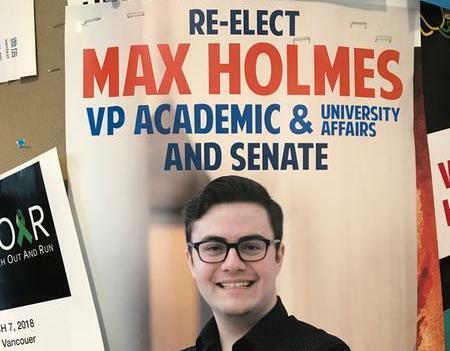 Some candidates’ posters certainly do it better than others. So to save you time from having to seek them out yourself, I’ve taken the time to go forth and nervously navigate around endless construction fences to snap photos of our dear 2018 AMS candidates’ posters. These were the only posters up as of February 28. Simple, and the colour scheme is pleasant to look at. However, the large print size of the text in addition to the border does strike me as cluttered. Also “VOTE NOW?” is a touch aggressive, don’t you reckon? Why is that so much bigger than your website’s URL? Are you asking me to vote before even reading your platform? No-can-do’s-ville, baby doll! Although it’s a little aesthetically… well, busy — after seeing him in the last couple debates, I think it speaks a thousand words as to what he’s all about. But I don’t think being “real” gives you that much of an edge when all of your competition (with the exception of maybe one) are also rocking corporeal forms. Ah, the almighty hashtag. I looked up #GivingBackToStudents on Twitter and the last tweet with that hashtag was from @StarbucksBank on March 27, 2017. I don’t really understand the point of its inclusion if you’re not flaunting that hashtag in the Twittersphere, Kuol. The formatting of this poster is ghastly. Also, the long campaign website URL in dreadfully small print doesn’t make me want to look at his platform at all. 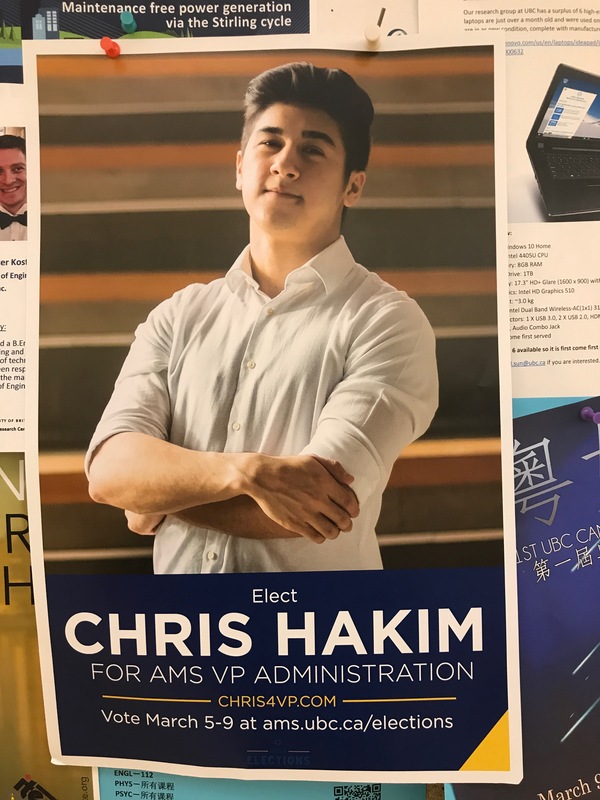 I really like Chris’s poster. 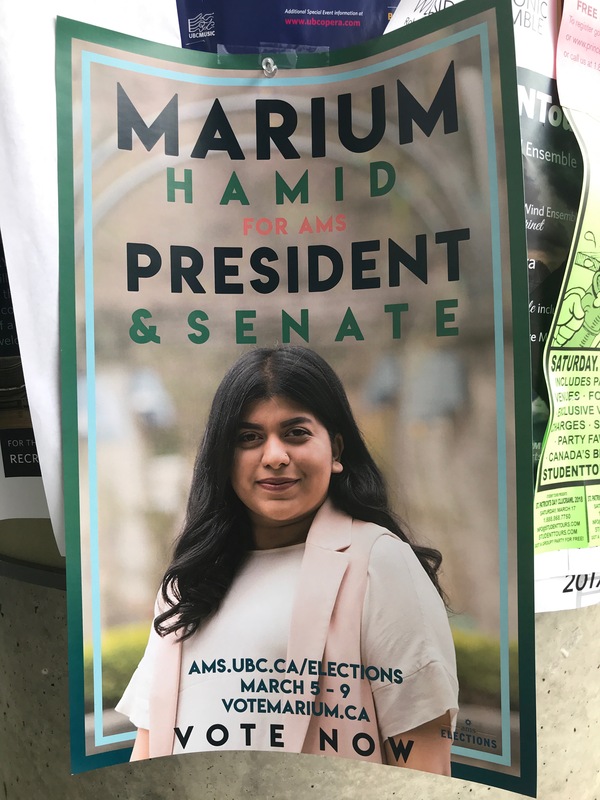 He utilizes UBC’s colour scheme — which in and of itself is very pleasant to look at — and the print is bold, clean and easy to read and has everything you need and not a touch more. I don’t know where to start with Aaron’s poster. The overload of green makes me feel nauseous. 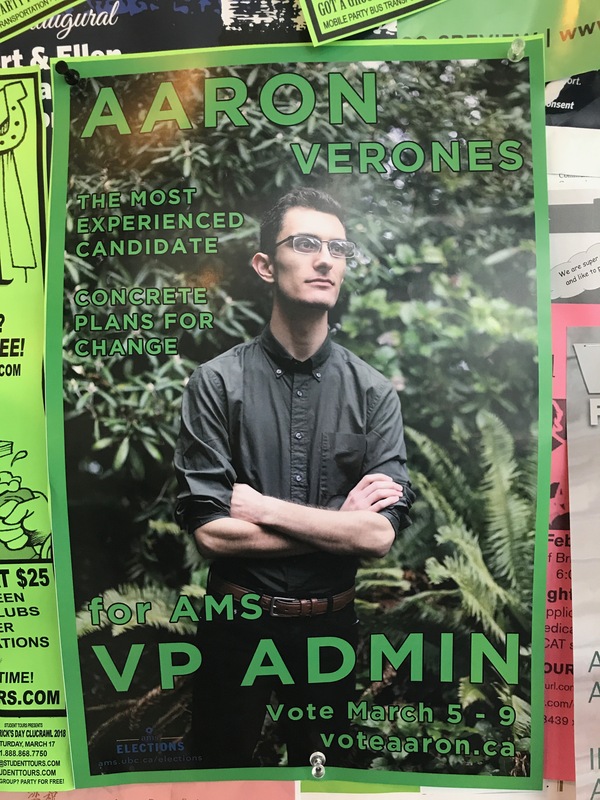 Unlike the other candidate’s posters, Aaron boasts that he’s “the most experienced candidate” (experienced in what exactly, Aaron?) I’d love to find out for myself, but I can barely make out your URL in that sea of green. I like her poster. The text, albeit a bit abundant, is well formatted. However, the student governance rhetoric strikes me as cheesy and unnecessary. What does “actionable affordability” mean? “Improved access” in what? What’s the point if we don’t know what you mean? I have a huge problem with this poster, and it isn’t the formatting or the cheesy slogan. It’s the fact that I could only find one copy of this poster on-campus and it was in the Henry Angus building and literally the size of my hand. How can we “join hands to bring the change” if there’s only one poster on-campus? I arrived in the Nest early today for my morning bagel to see a heartwarming sight — dozens of S.G. Krishna’s smiling mugs! He’s obviously stepped up his campaigning so I figured I’d update my review to reflect this. I am going to still have to dock points for that formatting though. Sorry, S.G.K. This poster is certainly pleasant to the eye. My biggest problem is there is no inclusion of a campaign website. 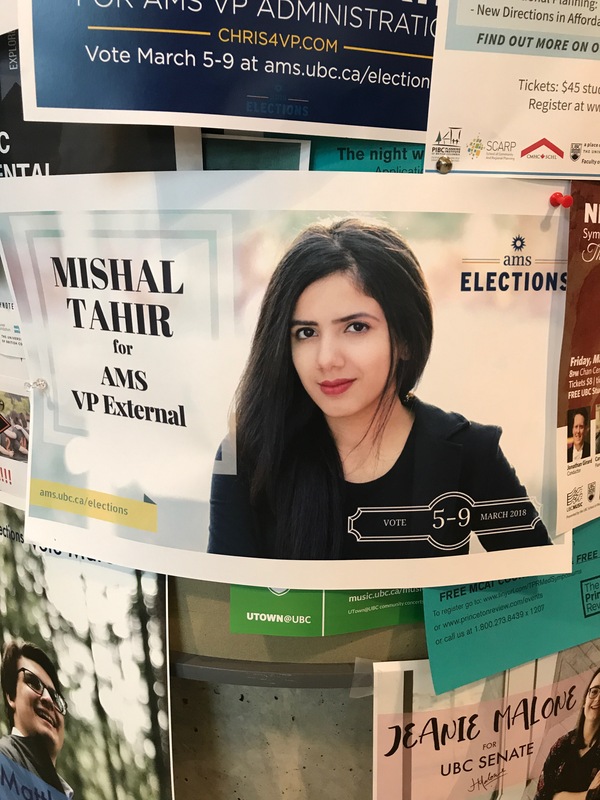 Mishal does have a website — which you can find on the AMS Candidates webpage, so why not include it? The poster has a good colour scheme, bold print that doesn’t overpower the subject, and all available information is there without any unnecessary rhetoric. Also, the inclusion of her signature is cute. Yeesh. I can barely see the dark navy text and, I’m sorry, but I’m not a fan of the picture of Leuprecht either. It’s got the potential to be a good “bewildered” reaction pic. The lack of a campaign website or e-mail to contact him is a major drawback, especially when you can barely make out the AMS’s website. Am I a graphic designer? Certainly not, and our candidates aren’t either. 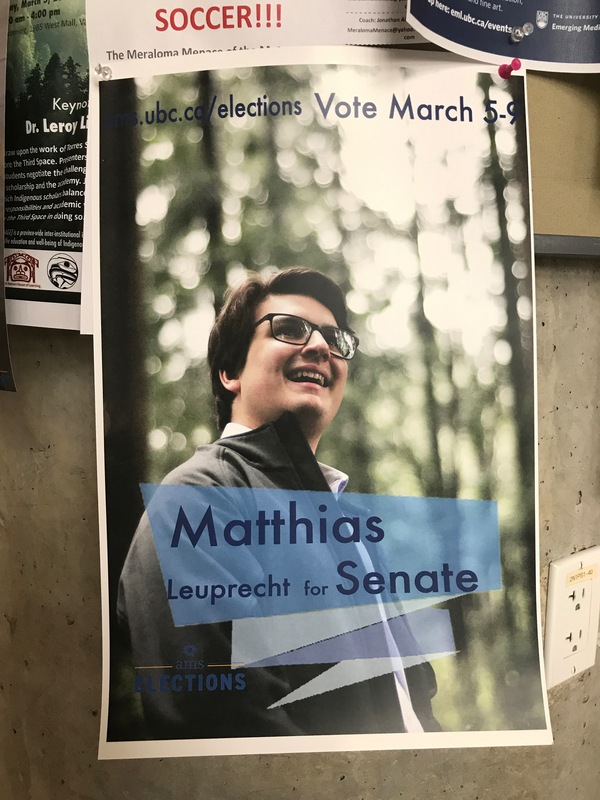 This election isn’t based off of their Photoshop wizardry — we’re voting based off of whether they are best suited to our needs as UBC students. 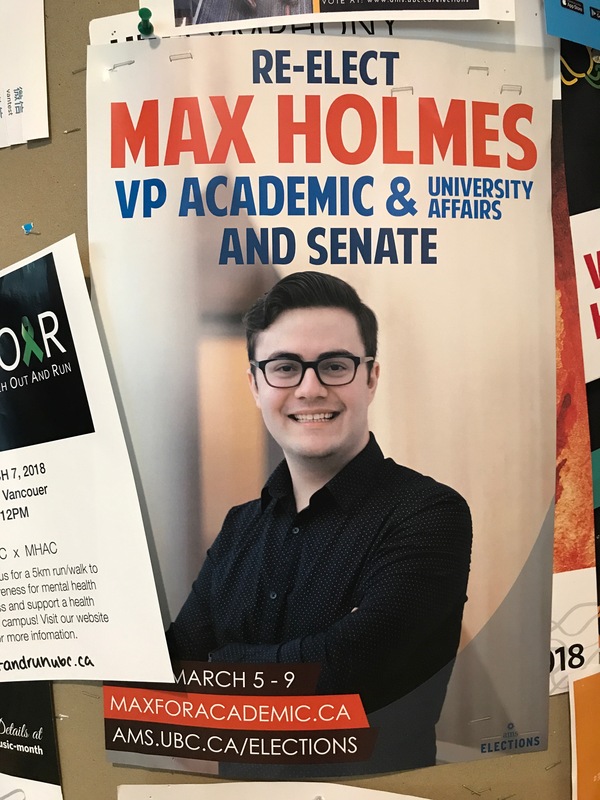 What these posters do is remind us that yes, student politics at UBC does exist, and that getting a second opinion before rushing to the printers isn’t necessarily a bad idea (you know who you are).